In 2016, aliens are enjoying a renaissance. The sequel to alien-centric 1996 blockbuster Independence Day opens in theaters this Friday. New episodes of The X-Files aired this year for the first time in more than a decade. Presumptive Democratic presidential nominee Hillary Clinton has announced that if elected, she would open classified files on Area 51, the Nevada Air Force base rumored to house evidence of the existence of extraterrestrial life. But the impact of any alien news today is unlikely to match that of 17 minutes of grainy black-and-white film footage debuted in 1995. Released by London-based producers Ray Santilli and Gary Shoefield, the so-called “alien autopsy tape” appeared to show three government pathologists in full-body hazmat suits dissecting the pale, pot bellied corpse of an extraterrestrial being, presumably recovered from a UFO crash at Roswell in 1947. Yet was the alien autopsy real or not? For a decade, that remained the million-dollar question. It was impossible to establish the film’s provenance. Santilli and Shoefield claimed to have bought the footage from a retired military cameraman in the U.S., but they refused to identify him, citing privacy concerns. A private investigator hired by Fact or Fiction’s producers couldn’t track him down. The following year, Santilli taped an interview with the “cameraman,” but the man didn’t give his name or show his face; though it was broadcast on Japanese TV, the segment did little to reestablish the cameraman’s credibility, or even proof of his existence. Meanwhile, several enthusiasts and experts featured in Fact or Fiction came forward to claim that their statements had been edited to make them sound less skeptical of the film than they were. By 1996, a consensus had developed that the film was probably a hoax. An episode of The X-Files called “Jose Chung’s from Outer Space,” which also aired on Fox that year, mocked the autopsy video with its own take on the genre. Dead Alien! Truth or Humbug? features doctored footage of an autopsy performed by doctor-turned-FBI agent Dana Scully. “It’s so embarrassing,” Scully groans, rolling her eyes. It wasn’t until more than 10 years later that the truth about the original autopsy video — or at least some of it — came out. Hosted by British TV presenter and journalist Eamonn Holmes, Eamonn Investigates: Alien Autopsy somehow managed to out-do Fact or Fiction. The show, which aired on the Sky network in Britain in 2006, featured much b-roll of a human in a cheap alien Halloween mask wandering city streets—but it also featured Santilli admitting to Holmes that the film he sold Fox was a fake, one he claimed was based on a real alien autopsy film. He had seen the original film in full once, he claims, but by the time he had gathered the money to buy it, it had become too damaged to use. So he and Shoefield built a set, hired actors and filmed their “restoration” so they’d have something to pitch to networks. The “cameraman” in the Japanese TV interview, Santilli also revealed, was a homeless man he picked up off the street. “It’s no different than restoring a work of art like the ‘Mona Lisa,’” Santilli said — a statement that could only be true if restoring the Mona Lisa meant painting an entirely new painting, of a different woman, on a different canvas, and passing it off as the original. Eamonn Investigates revealed other key players in the drama too. For example, John Humphreys, a sculptor based in Manchester, England, was part of the team that won a BAFTA for Digital Effects for cult TV series Max Headroom in 1987, and later worked on shows like Doctor Who. Humphreys told Holmes he was hired to make the fake alien corpse for the film, constructing the alien’s realistically bendable joints from lamb bones he sourced from a local butcher. Where does this leave the alien autopsy in 2016, as interest in extraterrestrial life seems poised for a resurgence? The rise of the Internet and social media means that hoaxes can spread more quickly today than ever before. But in the age of Wikileaks, it seems hard to believe that the government could keep a secret of the magnitude of a UFO crash under wraps for long. Advances in digital special effects also mean that seeing isn’t always believing. 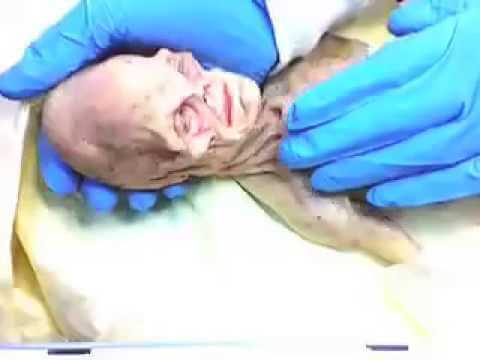 Footage of yet another alien autopsy, this one supposedly performed in Russia by the KGB, has been floating around YouTube since 2008 — yet almost no one seems to think it is real. But curiosity about other worlds and the beings that might live on them remains. And who knows — maybe one day authentic evidence of alien life will emerge. If so, the story of the alien autopsy hoax of 1995 implies that many of us would be ready to listen.